Columbus, OH—Testingreleased today found store and name brand foods produced and sold by the top four U.S. food retailers, Kroger, Walmart, Costco, and Albertsons—purchased in central Ohio and 14 cities across the country by Friends of the Earth, the Ohio Ecological Food and Farm Association (OEFFA), and other organizations contain residues of toxic pesticides linked to a range of serious health and environmental problems. “The findings of this report clearly illustrate why consumers are increasingly making the choice to purchase certified organic food,” said Amalie Lipstreu, Policy Director at OEFFA. Glyphosate, a probable human carcinogen according to the World Health Organization’s cancer research agency, was found on 100 percent of oat cereal samples and 100 percent of pinto bean samples tested. 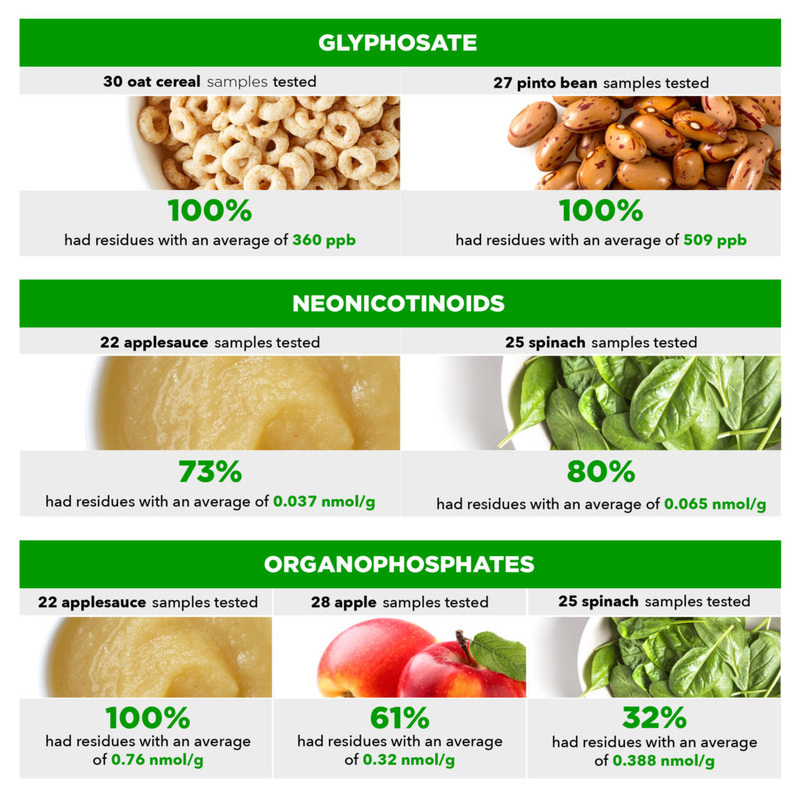 Organophosphates, which are so toxic to children’s developing brains that scientists have called for a complete ban, were found in 100 percent of applesauce samples, 61 percent of whole apples, and 25 percent of spinach samples, at levels ranging from 0 to 3.31 nmol/g. Neonicotinoids, which the European Union has banned due to robust science linking the chemicals to bee die-offs and which have been linked to endocrine disruption and autism spectrum disorder, were found in 80 percent of spinach and 73 percent of applesauce samples ranging from 0 to 0.14 nmol/g. Brands tested by an independent laboratory included Great Value (Walmart), Kroger (Kroger), and Signature Kitchens and Signature Select (Albertsons/Safeway). Kroger, Walmart, Albertsons, and Costco control over one third of all food and beverage sales in the U.S. Friends of the Earth and over 100 organizations are urging these companies and all food retailersto phase-out toxic pesticides in their supply chains. Friends of the Earth and allies are also calling on Congress to pass Rep. Nydia Velazquez’s (D-NY) bill H.R. 230 to ban the organophosphate pesticide chlorpyrifos. The study report details additional actions state and federal governments could take to eliminate the use of neonicotinoids, glyphosate, and organophosphates, incentivize transition to organic production, and direct public dollars to purchase certified organic food and beverages. “Ohio retailers can choose to phase out toxic pesticides and our state government can support the increasing number of Ohio farmers voluntarily transitioning to organic production systems. This will help farmers become more profitable and reduce the load of pollutants in our residents and our waterways,” Lipstreu said. Friends of the Earth is releasing the report today with OEFFA, Beyond Toxics, CATA-El Comite de Apoyo a Los Trabajadores Agricolas, Ecology Center, Environment Texas, Grassroots Environmental Education, Maryland Pesticide Education Network, Northwest Center for Alternatives to Pesticides, People and Pollinators Action Network, Pesticide Action Network North America, Toxics Action Center, Toxic Free North Carolina, and Turner Environmental Law Center. * Environmental Working Group determined that a one-in-a-million cancer risk would be posed by ingestion of 0.01 milligrams of glyphosate per day. To reach this maximum dose, one would have to eat a single 60-gram serving of oat cereal with a glyphosate level of 160 parts per billion (ppb) or a 90 gram serving of pinto beans with a glyphosate level of 110 ppb. The highest residue level from a cereal product sample (931 ppb, purchased from Walmart) would result in an estimated 58 µg/day glyphosate exposure, which is nearly six times greater than EWG’s health benchmark. The highest residue level from a pinto bean product sample (1,849 ppb, purchased from Albertsons) would result in an estimated 168 µg/day glyphosate, which is nearly 17 times greater. Testing released today found store and name brand foods produced and sold by the top four U.S. food retailers—Kroger, Walmart, Costco, and Albertsons—contain residues of toxic pesticides linked to a range of serious health and environmental problems. Products tested were purchased in central Ohio and in 14 cities across the country by Friends of the Earth, OEFFA, and other organizations. Glyphosate, a probable human carcinogen according to the World Health Organization’s cancer research agency, was found on 100 percent of oat cereal and pinto bean samples. Organophosphates, which are so toxic to children’s developing brains that scientists have called for a complete ban, were found in 100 percent of applesauce samples, 61 percent of whole apples, and 25 percent of spinach samples. Neonicotinoids, which have been linked to bee die-offs, endocrine disruption, and autism spectrum disorder, were found in 80 percent of spinach and 73 percent of applesauce samples. OEFFA is calling on the DeWine Administration and the Ohio Department of Agriculture to invest more in Ohio’s organic and transitioning farmers, who are producing food that is healthier for consumers, the environment, and our rural communities. Please take a minute to email them now and tell them you want the state to support organic agriculture. Click here.